Whether an interior space is open plan and needs to serve as a multipurpose room or it is one large room that was initially meant to serve one purpose only, spaces within a home can be adapted to serve more than two functions. 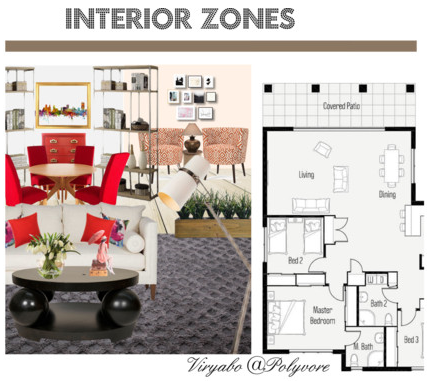 Where a room or space has multi-purpose uses, each area created is referred to as a zone. Zones within interior spaces must not only be functional and serve a purpose; they must be visibly appealing and laid out in such a way that each compliment the others. Zones work much better when there is ample floor space, for instance, a large room may serve as living area, dining area, reading nook and home office but if it’s a smaller floor space, zones may be limited to just a couple. You don’t want too many zones within a small space as it’ll end up a meaningless and cluttered room. First thing to do is to determine the focal point of the room. It is best to choose the widest wall of the interior space or the fireplace wall for instance. For a great effect, the focal point must serve more than one zone. in the image below, the headboard wall serves as a focal point both for the sleeping zone and the sitting area. You can differentiate zones with colour and though each may have differing colours, they must still complement each other. A room that serves different purposes or one that is created just for aesthetics must have plain and bold colours; light and heavy textures, plain and prints. Colour and texture can be introduced through the walls. Materials that work well together within one interior space are different techniques of paint application, paint/wallpaper; brick/paint; and wood/paint/wallpaper combinations. Choosing and placing the right kind of lighting in each zone in the room is crucial to the overall ambiance of the space, especially at night where you can light up one, two, or all zones, depending on the mood you desire. Using a combination of pendant light, table and floor lamps and sconces is best. Each zone with its own lighting effect gives amazing results. The floor can have different textures, sizes, and shapes of area rugs to show sections. The floor finish may also differ for each zone - different but complimentary wood floor; natural stone, or ceramic. You can also use floor levels to differentiate zones within an interior space. Having different floor levels is always a great idea and will give the feel of two rooms within one. For instance, a raised dining area distinctively separates the living from dining zones. 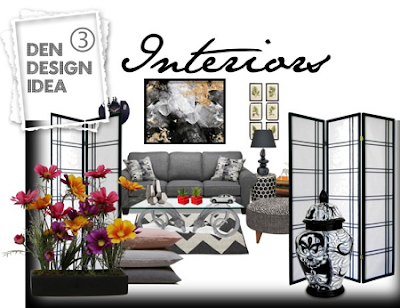 Create furniture groupings for each zone. Remember that each zone must seat different number of people. Create a larger area with a sofa, coffee table, and a couple of accent chairs and a smaller zone with a chaise, table, and lamp. Zones can also be created using high or low open-back bookcases as partitions and dividers. The top surfaces of low cases can serve for table lamp and decorations display. 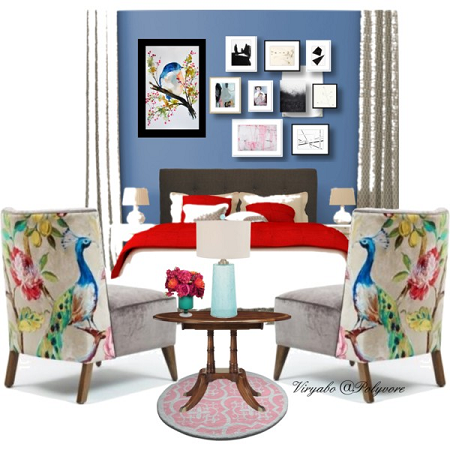 For a different look, angle furniture in at least one zone. Ensure all furniture placement, furnishings, and finishes not only enhance zone arrangements within a room, they must have a form of relationship with all elements within the entire interior space. Altogether, your zones must not clash. Rather, they must complement each other side by side within an interior space.